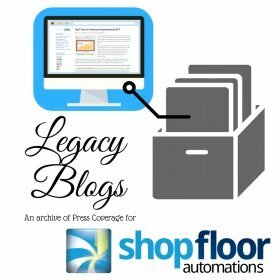 Since we understand the significance of backing up important documents, Shop Floor Automations also takes it’s own archival process very seriously. This edition has a big focus on our machine automation software and hardware. MFG Talk Radio published our article about graphical job scheduling, which was wonderful to see. Production Machining had us in their extensive Buyer’s Guide for their January 2017 issue – we were on pages 92, 94, and 97, in the areas of Software (under CAD/CAM & related software), ERP & Other Shop Management Software, as well as Support Equipment & Data Collection Devices for Gaging. CNC West was kind enough to publish us in back to back issues. In the December 2016/January 2017 issue, on page 66, they shared an update from us about DataXchange, quoting “new features include the MTConnect Data Viewer, making the software more compatible with MTConnect.” Then in the February/March 2017 issue, on page 54, they dedicated an entire page to our article about graphical job scheduling versus spreadsheets. To wrap it up, Industrial Machinery Digest wrote about our unofficial mascot, Shop Floor Man, in this piece. If you are curious to see what our comic strip character has been up to, check out our humor Instagram account. If you would like information on how to improve productivity on your manufacturing shop floor, please get in touch with us today! You can reach us at (877) 611-5825 or fill out this contact form.